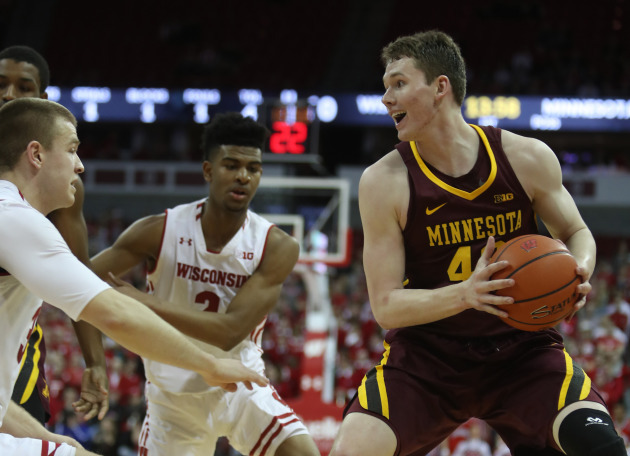 One of the toughest losses last season was the Gophers falling at Wisconsin in overtime. Just slipping through their grasp was the first victory in Madison in nearly a decade. It was a game the Gophers wanted to forget – quickly. Not the play of Michael Hurt, though. “I think it’s always a good feeling seeing the ball go through the hoop,” the 6-foot-7 forward from Rochester, Minn. said. “Seeing your teammates have the confidence in you to get you the ball and know you’re capable of making plays was definitely a real positive experience.”Hurt was nearly perfect with a career-best 15 points on 4-for-4 shooting from the field and 5-for-5 on free throws, to go along with eight rebounds. The performance showed Hurt’s potential as a major contributor for the U as a junior season this year. In a recent interview with the Star Tribune, Hurt talked about gaining confidence last season, his role moving forward, his younger brother’s pending college decision and more. Q: How would you describe the experience you had last season going from rarely playing as a freshman to major minutes and a starting role due to other injuries? A: I think it’s a lot like what happened with Dupree (McBrayer) and Jordan (Murphy) their freshmen year when they got thrown into it and had to play a ton of minutes. I got the same amount of experience out of it. I learned a lot throughout the course of the season and you pick up on some things. Q: The East Coast trip (Penn State, at Maryland and vs. Ohio State in New York) was particularly rough on you and Isaiah Washington not really seeing the floor much at all. How did you both bounce back after that for the remainder of the season? A: Isaiah improved a lot. I think he’s gotten more mature. We all kind of grew from last season. We both had some growth to do. Obviously, Isaiah being a freshman and a point guard he got thrown in there. It was different for him. For me, my freshman year I barely played much. I went from not playing a lot to playing big minutes (sophomore year). I think it definitely helped the both of us. Now that everybody is back healthy. (Coach Richard Pitino will) have confidence giving those guys a break and trust in us, because he was forced to put us out there last year. Q: Did it motivate you that teammates and coaches kept wanting you to be aggressive offensively and look for your shot? A: That’s what they needed from me. But it can’t be somebody telling me to do it. I just had to go out there and shoot the ball. You know what I mean. It was getting a feel and making instinct plays. Trusting my gut to make the right play. Q: You and fellow junior Amir Coffey are both unselfish and have great court vision. Does that make it hard to not always want to pass the ball and get other players good shots? A: Basically, sometimes we forget that if we have the ball in our hands we can go score, too. We’re just as capable of scoring, too. So I think now I’m getting a better feel for it. Amir has definitely got a better feel of when the right time is to shoot and the right time to pass. But I think we’re always looking for the next pass. We’re always looking for the guy that’s open. Q: Moving the ball, shooting, cutting, knowing the game, playing hard are all your strengths. But do some people forget that you’re actually a pretty good athlete as well? A: I think sometimes I can surprise my teammates a little bit with it. I’m not completely unathletic. I can make a few plays (above the rim). Q: What type of leadership role do you think you’ll have this season as a junior? A: It feels like those first two years went by pretty quick. I think with so many newcomers we’re all ready to take leadership roles. I think Eric (Curry) sat out last year, but he got to see the game from a coach’s perspective. So I think he’ll definitely be a huge leader for us. Having me and whoever we have coming off the bench will be a voice. I hope I can be a leader on the floor and off the floor whatever they want from me. I just hope I can help guys out. I’ve been through almost everything. Hopefully, I can give the younger guys some advice that can be helpful. Q: Do you see Pitino playing you more at small forward or power forward this season? A: We’re very, very flexible. When we’ve been practicing this summer we have so much flexibility with what guys can play. I’m playing the 3 and the 4. Eric is playing the 4 and the 5. Murph is playing the 4 and 5. Amir can play 1 through 3. So many guys who can play so many positions. A lot of our stuff is 5 out motion actions and things. Coach Pitino likes to use an example of Warriors basketball. I think just the flexibility we have. I think I’ll play a lot more 4 than I expected with (center) Matz (Stockman) leaving (transferring to California). Q: Your brother, Matthew, is a five-star senior recruit, so do you think playing for a blue-blood program over joining you at Minnesota will be too hard to pass up? A: It’s all about making the best decision for him. He has to understand who he’s going to play with and what the playing style is. He has to understand how the coaches are planning on using him and how he fits into their system. I think when it comes down to him making a decision; it’s got to come down to he has aspirations to play in the NBA. He’s got to understand that where he’s going to be able to be in the best position for that. Sometimes when you go to a big school, you might not get all your talents out there as much, just because you’re on a bigger team. Versus if you go to a smaller school maybe you do, but you don’t have as much exposure. So it’s all about making it balanced. He’ll make a good decision when he’s ready. Isaiah Ihnen, who visited Texas Christian over the weekend, said that Minnesota's coaching staff was able to keep him from signing with TCU with a great sales pitch.